The 2018 season of the FMSCI Indian National Rally Championship (INRC) was, without doubt, an absolute thriller for the competitors and spectators alike. While we often concentrate almost entirely on the drivers who take on the challenging rally stages, we tend to overlook those who play a vital role behind the scenes, more specifically, the motorsport teams who provide and prep the rally machines. One such team is Volkswagen Motorsport India (VMI), which extends technical assistance and parts support to all the participating Volkswagen cars during the INRC season. It is also claimed to be the only factory team that supports privateers with the technical expertise and spares by being present at various rounds of the championship with its race technicians and other support staff. By doing so, VMI ensures that smaller teams are able to compete on equal ground in the competition by providing them with the technical know-how of a factory team. The 2018 season the INRC was particularly rewarding for the Pune-based team as its Polo and Polo R2 managed to bag 37 podium finishes and 10 victories (inclusive of all INRC categories - INRC 1, INRC 2 and INRC 3) during the entire season. Running the Volkswagen Polo, teams Arka Motorsports, Snap Racing and Team Champions gave each other a tough competition in INRC 2. 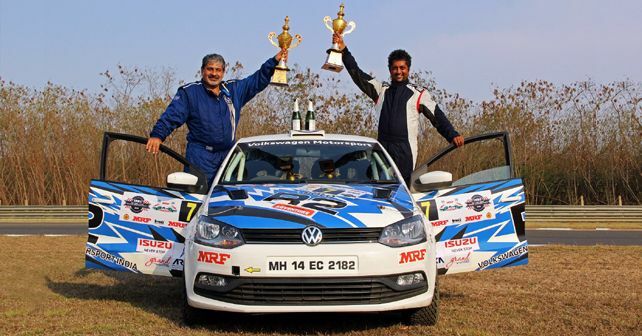 Piloting the Polo for team Arka Motorsport was Karna Kadur, who clinched the INRC 2 title. VMI also brought in a factory-prepped Polo R2 for three of the five rounds during the season. While guest drivers Vicky Chandhok and co-driver Chandramouli entered the Chennai round, Akbar Ebrahim and co-driver Kumar Ramaswamy helmed the R2 at the Coimbatore round and in its final outing, the R2 was driven by Sirish Chandran along with co-driver Aniruddha Rangnekar in Kochi. The R2 proved its worth by fetching the team three podium finishes in its three outings. 'We are now all set to build rally cars for our customers across INRC 1, INRC 2 and INRC 3 categories and deliver them before the start of the season,' he added.